Kicking off Dress Week with these amazing frilled heeled sandals by Dolce é Gabbana. Loving the asymmetric front strap and the ruched silk cascading down the front. Exquisite. Plus the profile shot is just as good. These shoes are very high-end evening sandals or for very special day occasions indeed, but how to wear them? As this is dress week, each pair of shoes will be paired with my choice of dress (this could prove challenging as the week progresses but let's see how much I am still enjoying it by the end of the week)! This is my beautiful dress choice to wear with these heels! 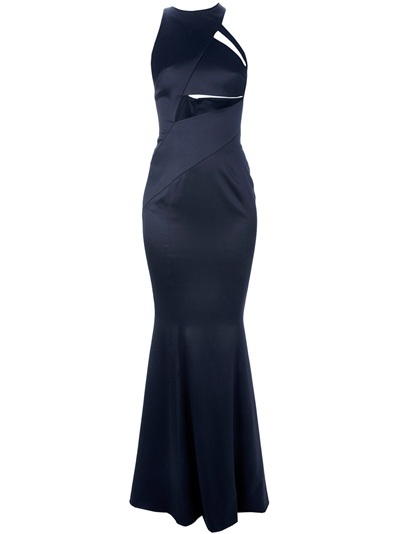 The dress does look more navy blue in the picture, granted, but it is listed as being black, and I am just in love with the lines and the asymmetric cross front detailing.